Trine Finally Comes to PlayStation Network in the U.S. The whimsical physics platformer Trine is finally available on the PlayStation Network in the U.S. and if you're curious about why it took so long, the guys at Frozenbyte are more than happy to explain. Trine is a great little game. 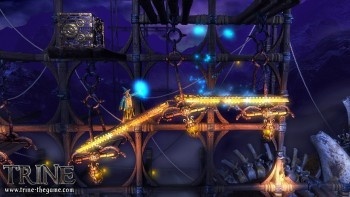 Its conventional side-scrolling gameplay is enhanced by physics puzzles, charming characters, great music and a unique, colorful fantasy setting. It was released for the PC in early July, while PlayStation owners had to wait until mid-September - if they lived in Europe. If you happen to be a PS3 owner in North America, however, you couldn't get your hands on the game until yesterday. Wonder why? It's a long story, but fortunately one that Joel Kinnunen of developer Frozenbyte is willing to tell. The PSN release of the game was never planned to take this long, he said, which should probably go without saying; in fact, he claimed the original plan was to see the game launch on PSN first. The PS3 version, however, was more troublesome than anyone anticipated. "The problem was that as inexperienced console developers, we did not anticipate all the issues that would lay down the road for the PSN version," Kinnunen said. "I'm sure the publisher wasn't expecting it either - the game was essentially done and we thought it would be released on PSN shortly, just before or at the same time as the PC version." "Of course, things did not go to plan. The game came back from testing with a list of things to fix, and those needed to be fixed before the game could be submitted again," he continued. Those problems were typically small and simple to fix, he said - wrong version numbers, wrong error messages, etc. - but console manufacturer "rules" require them to be dealt with prior to release. "More often than not they are 30 minute jobs each, so we stayed late at the office and usually delivered a new build on the next day to the publisher, who in turn had to resubmit it. Each submission causes a number of weeks of delay, and we had to go through this multiple times. It started to get quite frustrating at the end, believe me..."
The U.S. version of the game was submitted to Sony "swiftly" after the European version was given the green light and Kinnunen said he's not sure why it took so much longer for it to be released. The final decision on a launch date is up to Sony, he said, suggesting the company may have "wanted to give the game a good window with regards to other PSN titles." "Just imagine how it feels when you have worked extremely hard for 18 months, made a great game, and then all kinds of unwanted things happen, many of which you had very little influence on," he added. "It's not a great feeling I can tell you that." Fortunately, there's not much need to complain about it at this point; Trine is now available over the PlayStation Network in the U.S. and at 20 bucks it's a bargain. Don't want to take my word for it? Grab the demo at www.trine-thegame.com.